Score a GREAT DEAL on the TOP BRIGHT Block Toy for Toddlers – Wooden Building Letter Blocks 3 Year Old Boy Shape Sorter Toy -150Pcs today for only $34.99 $17.49 from Amazon when you use coupon code C82XKFOW ! You will get FREE Shipping if you are a Prime member! If you are not an Amazon Prime member you can grab a FREE 30-Day Trial HERE! Get the all the Details of this deal below! check out more deals we have posted using Amazon Coupon codes! LEARN WHILST PLAYING :Top bright wooden blocks toy for toddler is ideal for introducing early math and architecture concepts through pure, authentic play.When your 3 year old boy plays this wooden blocks toy , they are doing one of the best brain building exercises for developing their logic skills 、spatial relations、shape orientation and letter recognition. .
Top Bright wooden blocks toy for toddlers is a collision between innovation and old school .With these rubber blocks，the imagination of toddler and his interest has been exhibited well. Our wooden blocks toy for toddlers are made of high quality wood and BPA free plastic .Fully tested to the highest U.S. ASTM F 963 and European EN71 toy safety standards. This set of wooden blocks toy for toddlers comes with 150 -pcs blocks and a storage bucket with lid which also is a shape sorter .It is a great opportunity for your 3 year old boy to learn how to collect toys by themselves . Early education is crucial for the development of young children. Our team has made a great learning toy: it is fun, colorful and stimulating. Not to mention this wooden blocks toy for toddlers travel through rigorous testing procedures to make sure all safety requirements are met before it’s presented to your 3 years old boy. We crafted this blocks toy for toddlers to aid the development of cognitive and fine motor skills,and hand-eye coordination. Founded in 1989, Top Bright primary focus on creating uniquely memorable line of developmental toys for babies and young children that incorporate tons of love and excitement. We’re creating more than just toys, they are a direct channel of communication from our hearts to you and your kids. 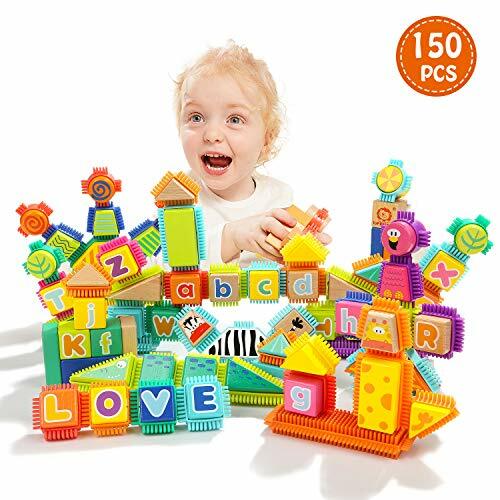 Don’t miss this deal at Amazon Today on the TOP BRIGHT Block Toy for Toddlers – Wooden Building Letter Blocks 3 Year Old Boy Shape Sorter Toy -150Pcs for only $31.99 $17.49 after the coupon code C82XKFOW is entered at checkout!